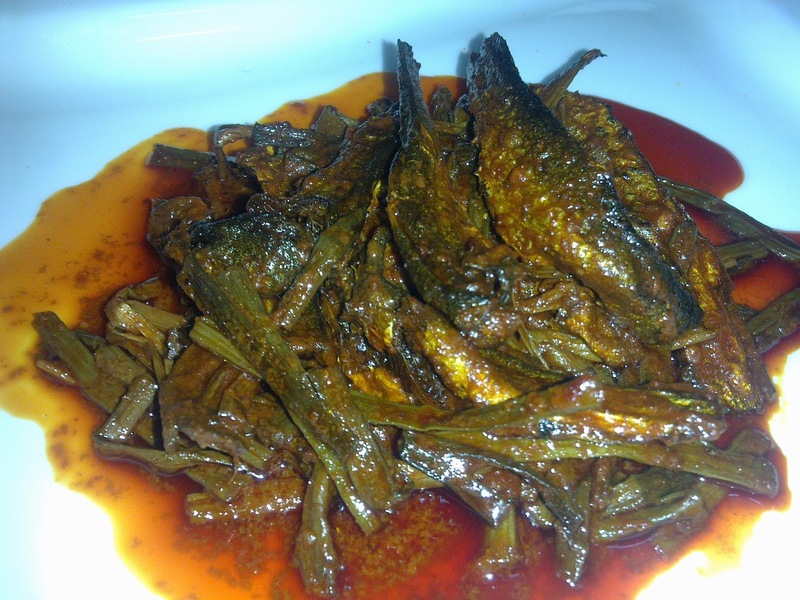 Hogaad are the dried fish mostly cooked and eaten in winters. It is cooked in combinations as well. Hogaad is available in abundance in winters. We can dry the fish easily at home in summer by keeping them in direct sun light after washing them properly. To save them from the kites, hawks and other predators, they should be wrapped in malmal cloth (very thin cotton cloth) and hanged outside the balcony or terrace till dry. 250 g hogaad (dried fish). 2 big table spoons laal mirchi powder (red chilly powder). 2 big table spoon saunf powder (fennel powder). 1/2 table spoon saunth powder (ginger powder). 1/2 tea spoon haldi powder (turmeric powder). 1/2 tea spoon hing (asafoetida). 1 table spoon ajwain powder (carom powder). 5 saboot sookhi laal mirchi (dried red whole chilly). 5 half crushed laung (cloves). 5 laadles of mustard oil. Clean hogaad, cut the fins and tail and remove off the head. Roast them in a pan for 2 minutes with constant stirring, care should be taken to avoid burning. Put them in a big basin till cool and then soak them in fresh water for 3 minutes and rinse four to five times in such a way to avoid breakage. Put them in a sieve and keep aside to drain off the water. Cut bum into 3 inch pieces, soak in lukewarm water for 5 minutes and rinse 4 times in fresh water carefully to avoid meshing. Heat oil in a pan and fry the hogaad, put them in a bowl and keep aside. Put zeera, cloves, mirchi powder and hing in oil along with 1/2 cup of water. Put the pan on low flame and stir the contents properly till the oil separates and deep red colour appears. Add water, salt, saunf, saunth, haldi, salt and ajwain in a patila in which hogaad is to be cooked. Put the contents of pan in patila along with fried hogaad and cook for 5 minutes on full flame. Add bum and cook for another 4-5 minutes on low flame. Remove the lid and allow it to cool for 15 minutes. hello Ms. Anjali , Could u plz contact me on gmail .. My id is drwaseem2kx. I hope you will do. Thanks.